The new DN495 spinner spreader can convert your applicator into a 3-season machine in as little as 4 hours. This equipment doesn’t only have a capacity of 300 cubic feet, enabling it to carry 10 tons of fertilizer, it also helps to make your job in large fields easier and quicker than ever. In the video below, you will learn how to correctly operate the F4365 with the spinner spreader applicator attached. There are two modes in which this is able to run. The first mode is “Full Auto Mode,” which runs the engine in the lowest RPMs, meaning, when the throttle is pushed all the way forward, the machine will still operate at 1200 RPMs until more power is needed. The second mode is known as “Manual,” which is used for maximum productivity when spreading high rate line or in hilly conditions. Auto Mode is ideal for those flatter, lower rate conditions. This spinner spreader allows anywhere from 75 pounds-per-acre up to 3 tons-per-acre, with spread widths up to 105 ft wide. This will permit you to cover more acres per day and get the job done quicker than ever. Not only does adding this attachment to your liquid spreader cover more acres, but it has the ability to apply two products simultaneously at predetermined or variable rates. This doesn’t just reduce time in the field, but also compaction, and fuel. Save yourself even more time by not having to stop and reload fertilizer by enabling bin chaining on the DN495. You may be wondering what this means, but it’s quite simple. When bin chaining is activated, it automatically switches from one bin to the other as soon as the first bin is empty, allowing you to finish spreading the load without any interruptions. If you’re looking for a spinner spreader to attach to your applicator, consider the DN495. It’s the ideal attachment to not only cover more land but simultaneously apply two products at once. 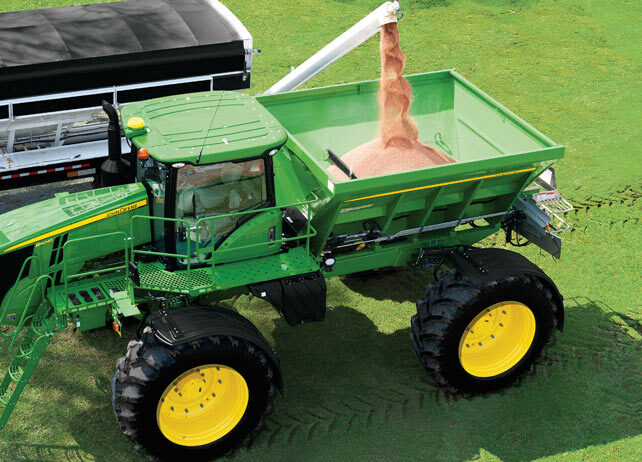 For more information about the DN495 attachment or other spreading equipment, contact your local John Deere dealer.